We are offering High Carbon Ferro Chrome to our clients. 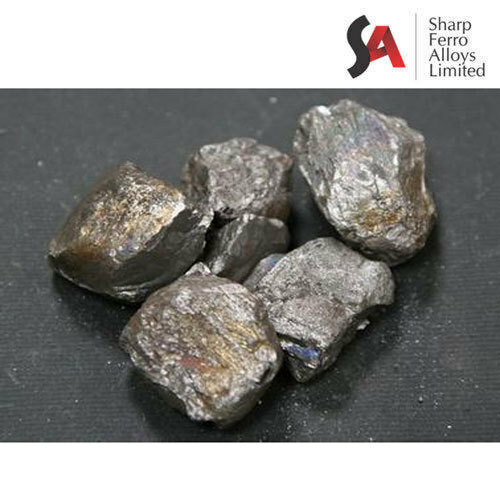 Sharp Ferro Alloys (SFAL) is one of India’s leading producers of Ferro Alloys. The 17 years of journey of SFAL is driven through people orientation, people leadership, process standardization, improvement and innovation. Established in 1997 in Durgapur, West Bengal, SFAL has expanded its activities in Raipur and Vishakhapatnam in a short span of time. Backed with state-of-the-art technologies and facilities, the company has the flexibility to produce different types of Ferro Alloys as per market dynamics. This adds to the competitive advantage of the organization as different product mix can be maintained at the same time even with low quantity. Various modern management initiatives like Six Sigma, TPM, Supply Chain Management and Performance Management Systems are in place to promote excellence in all areas and improve the overall efficiency of the company. SFAL has to its credit ISO certificates for quality management and compliance. The company has also been awarded Star Export Trading House status by the Ministry of Commerce and Industry, Government of India and is prospering with its emergence as a prodigious exporter of Ferro Alloys from India. Further, the strategic location of our manufacturing facilities close to the ports and proximity to basic raw material sources minimize the freight cost and make the facility highly cost competitive in the domestic and global markets, enabling us to build an immaculate export market as well. At present, with 7 furnaces across three factories, SFAL has a production capacity of 120000 MT per annum.